Kemal Kılıçdaroğlu was born in Nazimiye District of Tunceli Province in 1948. He continued his primary and secondary education in various places like Erciş, Tunceli, Genç and Elazığ. He studied economics at Ankara University in Ankara, from which he graduated in 1971. After university, Kemal Kılıçdaroğlu entered the Ministry of Finance as deputy accountant. He was later promoted to accountant and sent to France for additional professional training. In 1983, he was appointed deputy director general of Revenue Administration attached to the same ministry. In 1991, Kılıçdaroğlu became director general of the social security administration, Bağ-Kur. The following year he was appointed director general of the other social security administration, SSK. Kemal Kılıçdaroğlu was named in 1994 "Civil Servant of the Year" by the weekly periodical "Ekonomik Trend”. 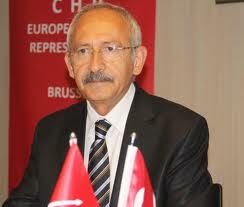 Before retiring in 1999, Kemal Kılıçdaroğlu had served for a while as the deputy undersecretary in Ministry of Labor and Social Security. He taught in Hacettepe University for a short period. He chaired the ad-hoc committe of informal economy, established during the preperatory works for Turkey’s 8th five–year Economic Development Plan. He was one of the Board Members of Turkish Is Bank. Following the 2002 general elections, he entered Parliament as member of parliament from Istanbul. He was re-elected to parliament in 2007. He became the deputy speaker of his party's parliamentary group. Kılıçdaroğlu was elected as Chairman of Republican People’s Party at the Party’s Congress in Istanbul on May 22nd.